This past weekend I celebrated my birthday by going to Vancouver with my wife and spending a couple of relaxing days at the River Rock Casino and Resort. A few months ago I had let it slip that legendary comedian and entertainer, Don Rickles, was performing at River Rock for two shows, one being on my birthday. My wife, ever the planner, decided to get us tickets to see Mr. Rickles perform. She purchased the tickets months ago and had a difficult time keeping it a secret from me... (I had a strong assumption that she had obtained tickets to the show). I had only ever seen Don Rickles on David Letterman or the Tonight Show with Jay Leno. Every time I saw him I would crack up. His patented “insult” style is hilarious. He picks on everyone, there is no one who is safe when Mr. Rickles is on stage. So as we arrive at the resort my wife shows me the tickets... we have second row, center. I was so excited. I mentioned to her that "... you do know being in the second row, he's going to pick on us right?". Little did I know how true these words would become. We spent a great evening Friday night, walking around the resort and Casino. We stopped at a lounge where there was a Neil Diamond tribute band that was amazingly entertaining. We enjoyed a beverage and then decided to call it an evening. Saturday morning we had scheduled a couple of massages at the spa. Saturday was my birthday so this was a real treat. We enjoyed the day and as evening approached the anticipation for the Don Rickles show continued to build. The show was to start at 8:00 pm, but was delayed due to some "late arrivers". By this time I was extremely excited. I was actually going to see a legendary performer. In what is now a little ironic, on the big screen it showed the upcoming shows coming to the River Rock theater with one of them being George Carlin. I found out this morning that George Carlin passed away yesterday of heart failure. This was a man that was friends with Frank Sinatra. 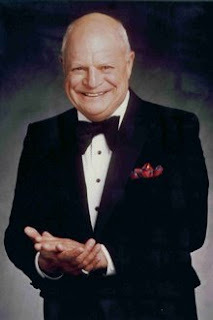 This is a man who has starred in prime-time series for all of the major networks including CBS' “The Don Rickles Show”. This is a man who has starred in films such as Kelly’s Heroes opposite Clint Eastwood, starred in Martin Scorsese’s Casino and had a voiceover role of “Mr. Potato Head” in Walt Disney Pictures’ computer animated features, Toy Story and Toy Story 2. The man has done it all. He is Mr. Entertainment. So the band begins performing a number as we are about 10-minutes late with the start of the show. I love this big band stuff, the band was in fine form. Then a few minutes late with his theme song (think of a bull fighter stepping into a ring...) the man himself appears, Mr. Don Rickles. He came out beside us from the side of the stage. At first I wondered if he would even make it up the steps to the stage as he looked so frail. Remember that Don Rickles is 82 years young. He gingerly walked up the steps to the stage and greeted the audience to roaring applause. It became surreal to me... here I was row two seeing an entertainment icon. Right away he started picking on people in the audience. Being in Canada, he made jokes about playing in clubs in places such as Regina and Montreal, ridiculing the people of both cities. Mr. Rickles continued with his jokes and then performed a song where he danced and pranced across the stage. After the song, he bent over a little winded an said "give me a moment".... all along cracking joke after joke. I wasn't sure if this was part of the act or if he was simply a little winded. Regardless he did move as you would expect an 82 year old man to move, a little like a penguin roaming around an ice capped island. So as the show progressed Mr. Rickles continued to pick on everybody around us... then about half way through the show it happened... "Hey big fella", he said looking in my direction, "What's your name?" I replied nervously, "Jody".... he mocked me with a scrunched up face, "Jody"... well Jody come up here".... Yes he motioned me to the stage. He replied, "c'mon hurry up." I left my seat and made my way to the stage.... he continued "... wow look at the size of him... hey Jody do you want a banana?" He stated as the crowd laughed. (I have wide shoulders and I guess resembled a football player to him." As I arrived on stage, he greeted me with a wink, smile and a warm handshake. I responded with "it's an honor Don" (Later feeling that I should have called him Mr. Rickles as opposed to Don) I couldn't believe how little he was coming up to my chin or so. He began by asking me what I do and I responded I work with the search engines you know Google and Yahoo. He chimed in with "Sounds exciting", as he rolled his eyes with the crowd laughing yet again. He then away from the microphone commented that he liked my outfit (I was wearing some striped suite pants and a white collared shirt.) He also made a comment that he "loved the hair" referring to my longer flowing hair which is absent from his own head. Then he said "Jody I like you, I really like you" and he gave me a hug. It was surreal. He then said, "no Jody, I really like you." as he squeezed me even harder. I tried to free myself a little from his bear hug and he squeezed me tighter all the while cracking jokes. Then he called another fellow up from the audience and he came up on stage and Mr. Rickles began planning out a skit for the three of us. He whispered some dialogue to us that was so fast and long that we never would be able to remember it. We were pretending to be Japanese soldiers, and Mr. Rickles wanted us to bend over with our teeth sticking out to resemble a "stereotypical Japanese person". I felt a little awkward doing this with a number of oriental people in the crowd, but did my best. Then Don went to the other fellow telling him to say something in Japanese but the other fellow responded with some of the english dialogue that he could remember, Don hit him with the microphone and called him stupid or something like that... the audience was in hysterics.... so then Don Rickles turned to me and whispered ok Jody say something in Japanese"... so he places the mic in front of me and I make up something that remarkably sounded Japanese. He dropped the mic with a surprised look on his face and with the audience clapping and applauding he tells me to pic up the mic.... he says "...do you know what you just said? I shake my head to respond with a "No". He says, "You just told me to screw myself" The crowd of 1,000 erupted in laughter as did I. Mr. Rickles then told the crowd to give us a round of applause and as we returned to our seats we were presented with a gift from Mr. Rickles. A bottle of champagne featuring a cartoon characture of Don Rickles himself. What a great birthday present. (and I didn't even mention that it was my birthday). It was so surreal. I got to be on stage with Don Rickles for seven or eight minutes. Unreal. The show went on for another 20 minutes or so and I was still floating around on cloud nine. What a true entertainer Don Rickles is. He paid tribute to all of the US and Canadian soldiers who are over in Iraq and in other difficult parts of the world. He also gave the audience words of advice on making the world a better place and paid tribute to all of the moms out there... and with that just as soon as he appeard on the stage, he left. To a standing ovation. For 65 minutes Don Rickles entertained the audience like no other. The man is a legend. Thank you Mr. Rickles, you were tremendous.